We bought a keyboard for our home last week. My boyfriend wanted to learn and teach himself how to play the piano, and I get to benefit as I now get to practice some of my old classical pieces (such as Debussy’s Reverie) after taking 12 years of piano lessons as a child. I love our keyboard, a Casio CDP-100 88 full-size key digital piano, which was highly recommended by my good friend Vince, an amazing keyboardist and talented musician in the band, The Gypsy Dolls. And I love hearing piano music play in our home. 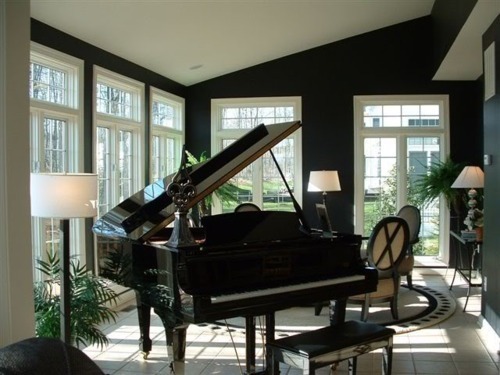 There’s nothing like live music – it is so beautiful and makes the home come alive. Anyway, it has made me realize how beautiful it is to have a piano in a home. 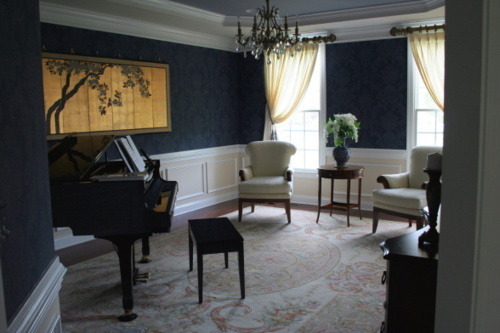 Of course, our little cottage is just too small to house a baby grand, but maybe someday! My dear friend Kelly, whose husband is a composer and piano protégée, has a beautiful Steinway baby grand in their home, and it definitely makes a statement. I truly believe it is one of the most beautiful accessories anyone can have in a home. Check out these photos below. Don’t you agree with me? Exquisite!